After searching online I could never find a review of this board and thought I should write one. I have had some brilliant sessions on the 112l wood construction from 2009. After trading in my 110l stoke for a 'highwind' board when we had the gales in 2009 I had felt like there was a big gap in my quiver and the jump from a 133l Carve to a 95l Fanatic freewave was too much. So I took the chance of getting a Kode after hearing good things about them, and as an all round board for the varied conditions I sail in. The gel coat had a few chips from hard use so the price was not high at all, but the glass under the area with the chips is fine and there are none in the nose. I have whacked the nose a few times in catapults and once when grounding the fin and it seems a lot stronger than my other boards, 2 of which have had nosejobs. My first session on it I felt like gybing came naturally, with so much float at the back but a lot better carving ability than my bigger board. On the Kode gybing just clicked into place, mainly because I was getting more confident and not worried about losing ground downwind all the time because I would go on much longer runs. This was due to confidence in the board as well, it was easy to get planing and a few pumps with a 6.5 Severne Gator would get it going in as little as 12-15knots. I got a bigger (42cm Drake slalom) and smaller fin (Simmer 34cm slalom) than the stock fin to extend the boards range and used it with a North 7.8 xtype, at first I found it wanted to luff into wind too much, but perhaps the wind was a bit light anyway this session. I moved the mast foot forward and this solved the problem. It did make the board a lot harder to tack, but shapened my skill in getting quickly around the mast. 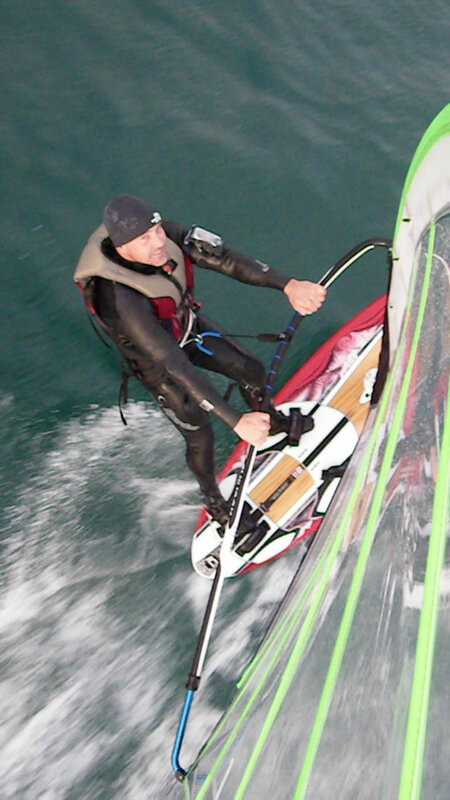 I have used the board with fully cammed speed sails and severne gators, it suits both styles of sailing with ease. Throughout 2010 it has taken me out of my first fully planing gybes and just over 30knots, making me develop more of an interest in speed sailing. It does leave me in a bit of a dilemma as I struggle with it once at about 110+ degrees off the wind, often spinning out over the small chop. I have bought a Select slam s11 fin but not had the chance to use it with the board. I like the easy progression the board offers too much though. In 15-25knots of wind with any water condition from flat, to chop, to boxy chop and waves it is easy to control and fun to play around on. Any more wind than that and I would be on a smaller board anyway, so the odd 30knot run can be sacrificed for some good hour runs and nautical miles while I save my money for a dedicated slalom board at this size. I could not trade this board in though as it gives me the opportunity to get out in swell and waves to do some jumping where a slalom board would not be suitable. If you are 90+kgs and progressing down to smaller kit, at the confidence building stage where you are wanting a much better ride but still be able to uphaul if needed then I recommend the board. 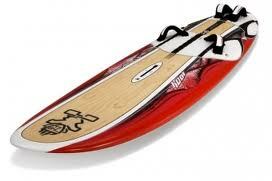 Also for more experiened riders looking for a fun all round board that is better than good at most things. I have kept up with people on dedicated slalom boards both on short runs and over distance. It has good rails making less than perfect conditions in light to medium wind strengths more fun to sail in, allowing a good long session as the tide goes up and down. I have had a few all day sessions where this was by far my most used board. Thanks Erik, hopefully I have solved the spin out problem by going off the wind in smaller stages, allowing the wind to take me with the gust rather than forcing the board befora and turning too far off. I read your article and have taken a lot of advice off your blog, cheers. It may feel a little small, it depends on your ability. Your weight means it could well be okay as it is quite a wide board, the 112l is 68cm wide and feels nearly as stable as my 133l. It would be harder to learn new moves on though, especially tacking. Mine sinks the second my foot is placed in front of the mast. Try one out if you can. Nice. I guess you should also visit this page to learn how to catch a cheater.